View our ever expanding database of record holders which is growing all the time. A Personalised hand written A5 sized signed letter of congratulations of your record in cardboard frame signed by president Dean Gould, or a signed photo. If your record has been accepted, you can purchase a quality RHR certificate. Check out our new RHR TV section which contains a variety of different interesting and funny video's. John Evans has a new medal to offer to record breakers which can be worn around the neck. 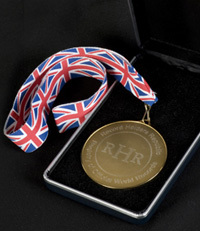 The medal is 70mm by 5mm and weighs 7 oz and it comes in a high quality, velvet lined, stylish black presentation box. The medal has RECORD HOLDERS REPUBLIC logo on the front and the record holders name and record on the back. Receiving this trophy would be the perfect opportunity to make the local news and show the RECORD HOLDERS REPUBLIC MEDAL and your World Record off again. Please send name and address and date and details of your record (ideally a photocopy of your certificate).